A fabulous blogger, MckMama, has organized a raffle at her blog raising money for three amazing organizations all close to my heart - String of Pearls, No Hands But Ours, and The Elison Project. 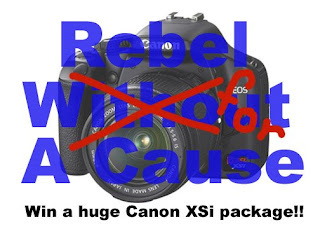 For a tiny donation to the cause using the ChipIn function on her blog, you are entered in the raffle to win a HUGE amazing complete ginormous fancy camera package. It comes with everything a serious or budding fashion consious photographer could possibly want. A chance to win something cool and the opportunity to help out *3* great causes!! How can you beat that? Click the graphic above, go read all about the raffle, and donate, people!